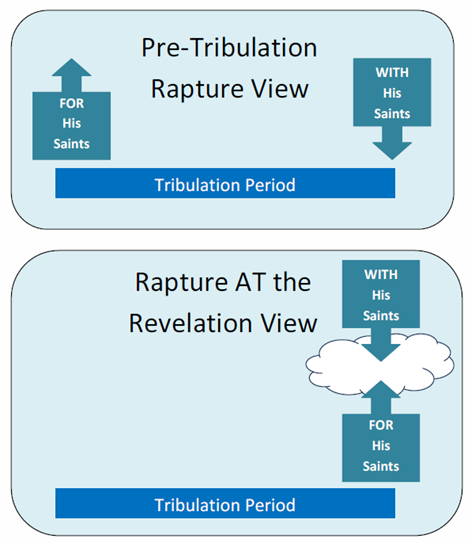 Those who believe in a pre-tribulation Rapture teach that Christ cannot come WITH his saints until he first comes FOR his saints. They teach that Christ comes FOR his saints before the Tribulation period begins, and then, seven years later, Christ comes WITH his saints in a glorious, visible return. But let's see what the Bible says. One of the chief passages in the Bible concerning the Rapture of the Church is I Thess. 4:13-18. However, this passage teaches that the Lord Jesus comes WITH his saints at the same time that he comes FOR his saints. "But I would not have you to be ignorant, brethren, concerning them which are asleep, that ye sorrow not, even as others which have no hope. For if we believe that Jesus died and rose again, even so them also which sleep in Jesus will God bring with him. For this we say unto you by the word of the Lord, that we which are alive and remain unto the coming of the Lord shall not prevent them which are asleep. For the Lord himself shall descend from heaven with a shout, with the voice of the archangel, and with the trump of God: and the dead in Christ shall rise first: Then we which are alive and remain shall be caught up together with them in the clouds, to meet the Lord in the air: and so shall we ever be with the Lord." How is it possible to come both WITH and FOR at the same time? Contrary to the pre-tribulation Rapture position, the Scriptures plainly and clearly teach that Christ comes with his saints (which are asleep in Jesus) at the same time that he comes for his saints (which are alive and remain). These two events are NOT separated by a period of years, but occur one right after the other. Indeed, they are so close in time that they are part of the same great event, i.e. the Second Coming of Christ!